An iconic Philadelphia athlete, Allen Iverson may forever be known for his rant about practice. LOS ANGELES — It has the two things you want in a season-ending press conference: a memorable line and one of the toughest athletes of all-time. On top of it all, Allen Iverson is wearing a Red Sox cap while repeatedly “talkin’ bout’ practice.” Not the game. Not the game. Not the game that he went out there and died for. But practice. Has it been 10 years already? What’s funny is that just the other day I was thinking to myself about this very memorable moment in sports history. I was wondering if we’d passed the 10th anniversary, and since I couldn’t remember it being discussed in the last year or so, that I must have missed it. But lo and behold, it’s today; May 7. Ten years ago, the 76ers were just bounced from the Eastern Conference playoffs by the Boston Celtics. Iverson averaged 30 ppg for the series but much of the talk was how he hadn’t been practicing between games or much of the latter part of the year. He had a meeting with Larry Brown, and then, it happened. I was always amazed how a guy 5’10” and 150lbs could dominate a game the way Iverson could. 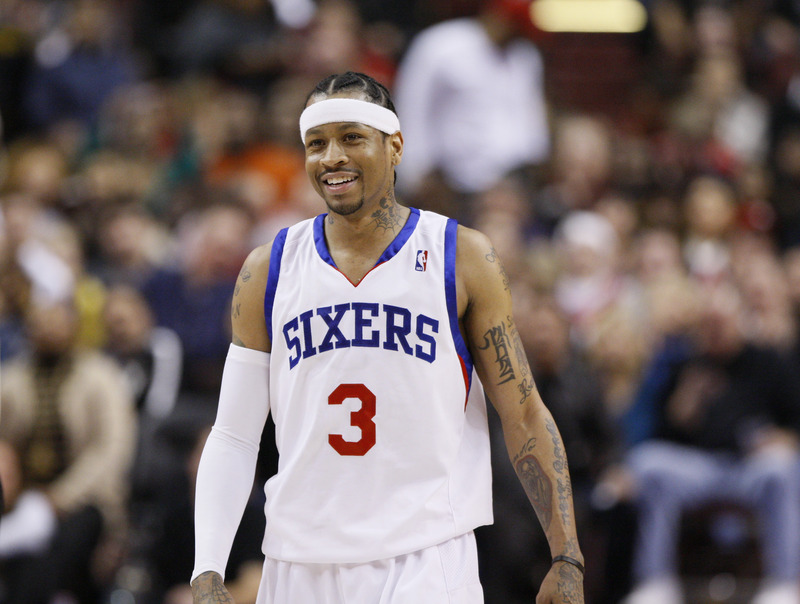 The end of Iverson’s career has been a sad exhibition of an athlete hanging on too long. We’ve seen it before and No. 3 won’t be the last. Stops in Denver, Memphis, back to Philadelphia and even the Dominican Republic; rumors of alcoholism and gambling dwindling his amassed roundball fortune, a terrible way for it all to end for him. Personally, I’ll always remember A.I. as the skinny kid at Georgetown with a flat top and one tattoo, who would cross over and then dunk on everyone. This after thinking he shouldn’t even be on the same court as these “real players.” His 1995 Big East title game vs. UConn and Ray Allen is beyond epic and I still have on VHS tape the 1996 Georgetown/UMass East Regional Final which featured Marcus Camby. With the 76ers, who could forget Iverson single-handedly willing a Game 1 win over the Lakers in the 2001 Finals, capped by him hitting a 3 in the corner and then stepping over Tyrone Lue. The NBA All-Star Game MVPs, the fearless drives the basket and, of course, the cornrows, Iverson was the face of the hip-hop generation of NBA players (for better or worse) and along with a few others, ushered in a new era in the NBA. So, please, pay your proper respects to not only one of the transcendent basketball players of our time, but to the soundbite that will live in our hearts forever. Posted on May 7, 2012, in Random and tagged 76ers, Allen Iverson, Celtics, Georgetown, Lakers, NBA, Philadelphia, practice, Red Sox, UMass. Bookmark the permalink. Leave a comment.